Think that a feature story on your brand is a pipe dream? Here's how to make the dream come true. One of the best ways to earn more value for your online marketing campaign is to get your brand featured in major media publications -- and here we’re talking about global, major-name publishers, reaching monthly audiences that number in the millions. As an entrepreneur, you'll probably find your mouth watering at the thought -- that’s a lot of potential visibility, you're thinking. But once you start thinking about the logistics, you’ll probably convince yourself it’s also a pipe dream . . . right? Wrong: Actually, the reality of getting featured in major media is more feasible than you might think. In fact, it can be reduced to a step-by-step process any brand can follow. Brand awareness. Though brand awareness is hard to measure, even indirectly increasing its breadth and depth will usually be beneficial for your brand. Reputation and authority. Getting featured on a major publication will earn you bragging rights and authority by affiliation. Merely posting the logos of publishers you’ve been featured on, in an “As seen on” section on a landing page can increase conversion rates. Referral traffic. Getting a link in a major publication could earn your website a stream of referral traffic that will last for as long as the article remains published (usually indefinitely). Domain authority. Google measures authority based on the quantity and quality of inbound links pointing to your domain; exposure on a major media publication is often accompanied by a link to your website, which can help increase your organic-search rankings significantly. Ongoing relationship value. As you build a reputation with a publisher, you’ll get more publishing opportunities, and an improved portfolio that enables you to reach out to even higher-authority sources. You might even get invited to be a regular contributor or columnist at a major media publication. You have two options for acquiring coverage on major media publications: Hire someone else to do it for you (like a PR firm), or do it yourself. The following five steps outline the DIY method which has worked for me, and dozens of my colleagues. The hardest part about this strategy, like many areas of business development, is getting started. Before you even think about trying to get featured in a major publisher, you need to take care of your own site, and build a reputation in your own right. Start by creating a blog for your website (if you haven’t already), and start publishing high-quality posts about various topics related to your industry. Every article should be well-written and detailed, as your blog is going to serve as a kind of portfolio for you as well as a basis for your initial audience. Aim to start with at least 10 articles that represent your expertise and the unique contributions or insights you can bring to your industry. If you need help coming up with topic ideas, see 101 Title Ideas for Your Next Blog Post. You’re going to be more enticing to the editor of a publication if you have a large and active social media following. Leverage the power of social media platforms like Facebook, Twitter and LinkedIn, and start syndicating your articles, reaching out to influencers and engaging with your new readers. This will take some time -- probably at least six months, depending on your budget -- to establish a sizable and engaged social media audience, but it’s hard to move forward without one. A following gives you credibility to prospective editors considering your pitches. For help getting social media followers, see 101 Ways to Get More Social Media Followers. 3. Start local and niche. Once you have a few thousand active followers and a blog that showcases your high-quality content, it’s time to reach out to editors at the publications you want to be featured on. Major national publications will probably be beyond your scope for a while longer (until you have some published work you can showcase across multiple smaller publications), so start by aiming for smaller opportunities in your reach. The best way to do this is through local publishers, with whom you might be able to establish a personal relationship, and niche publishers, who cater to your specific industry and demographics; the latter move cuts down your potential competition. Use LinkedIn or Twitter to find editors at your target publications. Then, reach out to them, and start a conversation. For an outreach template you can use, as well as ideas on what to pitch to editors, see this article. Next, start publishing more and better content on your company blog, while keeping your social media followers engaged by giving them new (quality) material, listening to their feedback and engaging them in regular conversation. Maintain your relationships with publishers with whom you’ve already developed relationships, and start working your way up to more prominent, authoritative publishers. This is going to be a slow process, so don’t be intimidated if you face rejection. 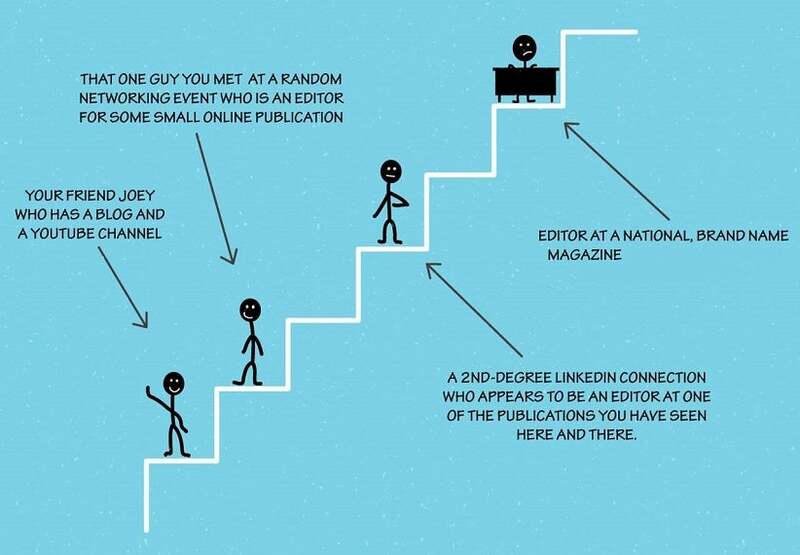 The process is a lot like climbing a ladder, starting with smaller publishers and working your way up to bigger, national ones. Image credit: Courtesy of Jayson DeMers. Be persistent; you aren’t likely to get a response on the first try. Build that relationship and show your persistence to keep your momentum moving forward. Once you’ve reached a threshold of audience size and publisher diversity that characterizes your brand as a thought leader in your industry, start targeting the major publishers you’ve had your eye on from the beginning. Now, the key is to make killer pitches. Don’t ask editors for a favor by featuring your brand; instead, do the publishers a favor by giving them content their audience will love, driving page views and social shares. To do this, you’ll need to get to know their niche and their audience well. One way to do this is by reviewing which content has performed best on their site, using a content analysis tool like BuzzSumo. Once you’ve done that, write a smart, original pitch that’s sure to pique an editor's audience’s interest and drive page views, engagements and shares. From there, you’ve got a good shot at getting your foot in the door. These steps aren’t easy -- in fact, some of them could take you months to dissect and master. But they are actionable, and they will bring you closer to your eventual end goals. Don’t underestimate this process; there’s no shortcut to get you to these benefits; only hours of work and dedication (or a partnership that leverages outside authority and experience) will help you succeed. In any case, the benefits will be well worth the investment.